Data is a big part of what we do. We are bound to make data-driven decisions and update or revise programs based on what the data tell us. However, it is possible to be so consumed with data that it interferes with learning. How well can a person engage and think on their feet if they’re consumed with recording data? The other downside of data is that it can hold the learner back from progressing. It may look like a student isn’t mastering any goals but a different type of data collection might do a better job of displaying it and preventing boredom and stagnancy. We feel strongly that the data should only support learning and never impede it. This is why it’s important to choose a method of data collection that allows for us to monitor and view change, that doesn’t hold the learner back, and that allows the therapist to engage and do good teaching! We try to emphasize that the child will learn more from good teaching than from good data. A rating scale is a way to describe behaviour along a continuum. It can describe level of independence with a task or resistance/compliance with an activity. We like to use rating scale measurement for early learners when we’re just starting out. During the time when the therapist and the student are getting to know each other, the relationship building and engagement (aka, pairing) is first and foremost. We would outline a few goals for the therapist to work on and then she can rate the child at the end of the session with how well he did that day. The ratings can then be graphed. Check out more on our Beginner Data Sheet and download a free copy. A rating scale is also a great measurement tool for group-based learning and NET (natural environment teaching). The therapist should be able to follow goals but without being too busy with a clipboard, clicker, or pencil. The quick rating scale allows us to track progress without it being too cumbersome. 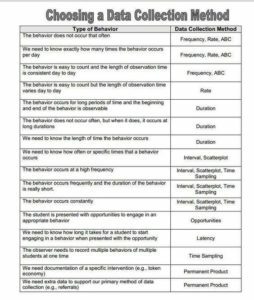 The way we would choose to track behaviour data would usually be individualized depending on the student and the behaviour. A nice way to track negative behaviour is to use a partial interval recording (read more about Using Partial Interval Recording to Track Negative Behaviour). 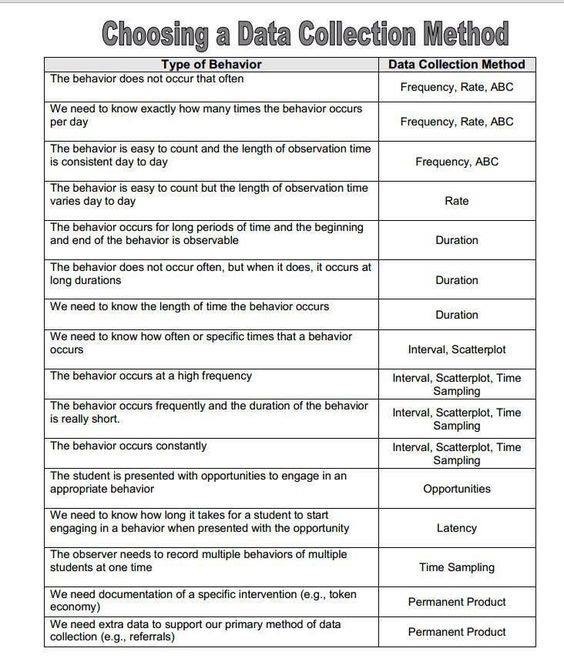 By checking off the minutes/times that negative behaviour is occurring, it also gives us information about duration and frequency which can then be graphed as well. Probe data means that we would take data on the first trial of a program and not on the rest. Teaching should still happen after the probe (especially if it was incorrect!). Mastery would be something like “3 correct responses in a row, across 2 different people”. Probe data can be great for moving students through programs who learn quickly and might only need a few exposures of the material. For example, when teaching “expressive labels”, we often put this on a probe data sheet so that multiple targets can be run at once and the child can move through it quickly. Caution: the downside of probe data collection is that therapists might not do as much “teaching” if there isn’t much data to record after the first response. Taking trial-by-trial data means that we would record data for each trial run (usually at least 10) and then get a percentage of correct responses. Mastery would usually be something like “80% or more for 2 days, across 2 people”. Some children need more exposure and the repetition and multiple trials are good for their learning. This ia also good for teaching generalized skills (eg: imitation) where that specific targets aren’t as important as the overall skill. Graphing the percentage tells us more information than probe data would. It’s not just about whether or not the trial was correct, but we can see if the curve is increasing or decreasing or if there are any other notable changes. As Behaviour Analysts, our skills lie in taking the strategies that we’ve mastered and applying them differently to each child. 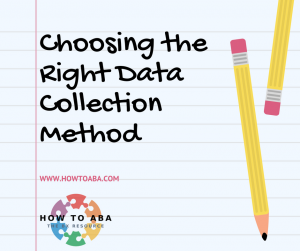 Make sure that the data collection method is helping your child learn, enabling you to update and observe progress, and makes it doable for the therapist, parent, or teacher to record data. 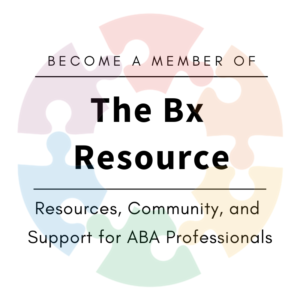 This entry was posted in ABA, Autism, behaviour analysis, learning, teaching. Bookmark the permalink. 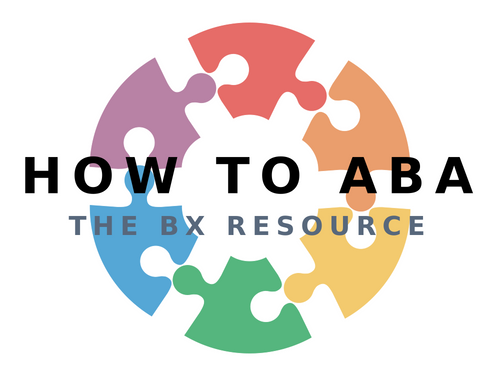 ← When is Behaviour Worth Targeting for Reduction?